At a hot summer meeting on a mostly deserted campus, the “Differences Organized Coalition” of fifteen groups protested University of Minnesota Board of Regents’ proposed tuition hikes, as well as decreasing access for marginalized communities, numerous sports and research scandals, Dinkytown gentrification, and investments with abusive corporations. The “Do! Coalition” has several primary demands: to treat education like a public good; immediate free tuition for American Indian students; President Kaler’s immediate resignation; divest from Blackrock Investment portfolios; and quit trying to crush protesters at the University. Note, Unicorn Riot does not currently have a list of all affiliated groups. 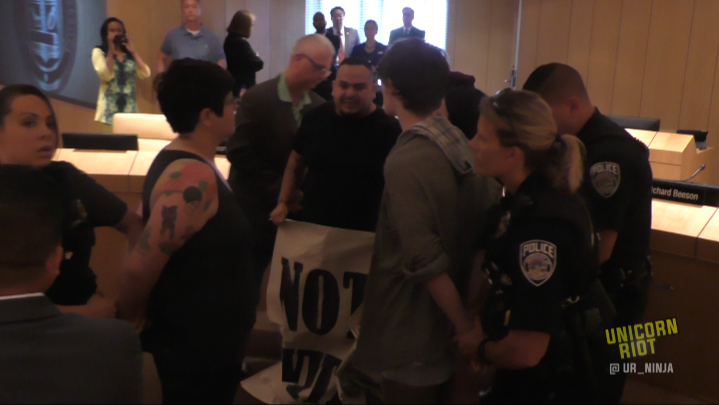 As protesters took hold of the meeting room, several Regents declined to comment (video here) to Unicorn Riot about the tuition hikes including former GOP legislator Laura Brod, Richard Beeson of Sunrise Banks, and Peggy Lucas a developer at Brighton Development. 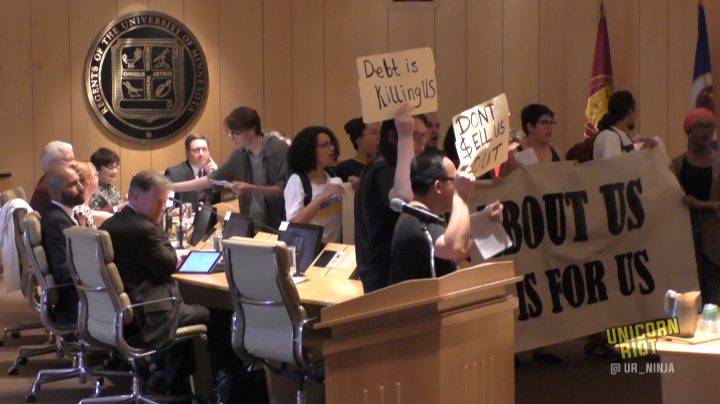 University of Minnesota Occupy's Regents Board Meeting in Protest Against Tuition Hikes from Unicorn Riot on Vimeo. 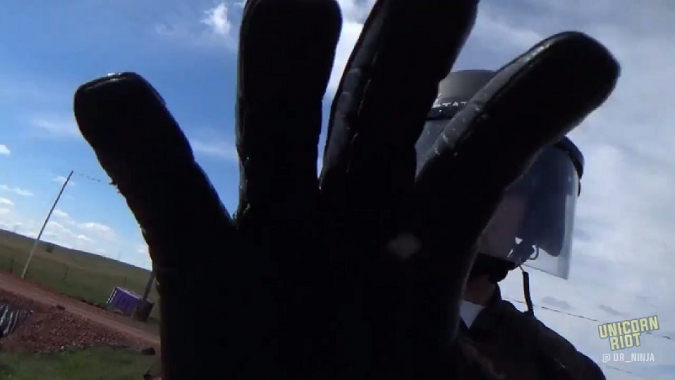 Six protesters, undergraduates and grad students at the U, were arrested, detained and ticketed. The rest of the protesters walked out after the arrestees and talked to the corporate media about the demands and worsening access to higher education. Speakers linked the Regents’ increasing pressure on students leading to what they prefer to frame as ‘individual’ mental health problems. 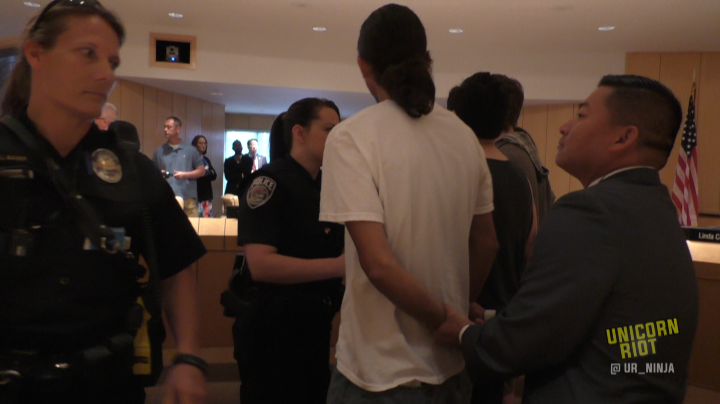 Security threatened the remaining protesters with arrest and they moved out of the building. Outside the McNamara Alumni Center, as the heat increased, students and retired and current educators talked about how this land grant university had extracted knowledge from many populations while now reducing broad access. The detained protesters were released after about half an hour and then talked about why they were fighting the Regents’ agenda, which some described as a neoliberal style plan to restrict access to academia and remold students into thoughtless “clones”. Similarly during the protest we twice asked Dean Johnson, former top legislator in both parties, and Chair of the Board of Regents about investments in private prisons and whether that is ethical for the university. 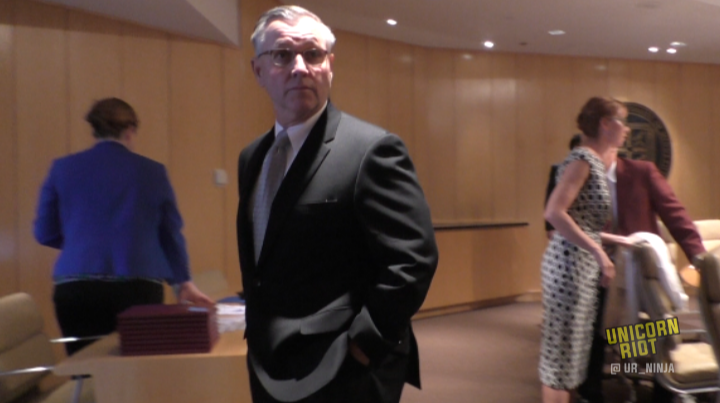 Regents Chair Dean Johnson refused to talk about private prison investments or tuition hikes. Johnson is a political veteran, a chaplain ranking as general, a Lutheran pastor for forty-plus years with a masters degree in strategic studies from the Army War College. Yet he was unable to share with Unicorn Riot any moral or logistical views on U of M money going into private prisons through Blackrock on his watch. Instead, using hand gestures, Johnson ordered third parties to force us to cease any inquiries about his policies. The livestream wrapup by Dan of Unicorn Riot after the rally including a summary of the demands is here. As of 3/31/2016 Blackrock Fund Advisors owns $152 million dollars, 4.4 million shares of Corrections Corporation of America, while Blackrock Institutional Trust Company owns 3.9 million shares valued at $135 million. Blackrock also is a major player in other public investment and retirement systems in Minnesota, collecting millions in fees annually. For example in 2011 their entities collected $1.5 million in management fees from another publicly backed entity controlled by the State Board of Investment: Teachers Retirement Association of Minnesota. Also Minnesota’s state 2015 Supplemental Investment Fund prospectus shows U.S. Stock Actively Managed Fund, U.S. Stock Index Fund, Balanced Fund and Bond Fund categories all have investments managed by Blackrock. There is no compelling reason that index funds need to be held with Blackrock, as they are set up to automatically follow the stock market indexes without any judicious management. To help our non-profit media collective please consider a tax-deductible donation by clicking the banner below.